And the most intriguing aspect is that all of them are on the same straight line. Too odd to be natural, right? Mars is full of surprises and our understanding of this mysterious world grows each day with the help of intriguing discoveries such as the following one. Artificial towers on Mars would be just another addition to the long list of enigmas catching sand on our planetary neighbor. The three towers are featured in a video uploaded by YouTube channel mundodesconocidoand we strongly encourage you to turn on the captions and give it a watch. But do hurry since these controversial discoveries tend to be quickly censored. While investigating the Red Planet with the help of Google Mars Map, channel curator Jose Luis discovered a row of enormous towers on the martian surface. Each of the three towers stands almost a mile tall. This would be a very impressive feat of architecture considering that the tallest building on Earth is only half this size. Google used data from the Mars Global Surveyor (MGS) and its photographic instrument. The specific image showing the towers was captured in 1999 so a lot could have changed in the nearly two decades that have since passed. 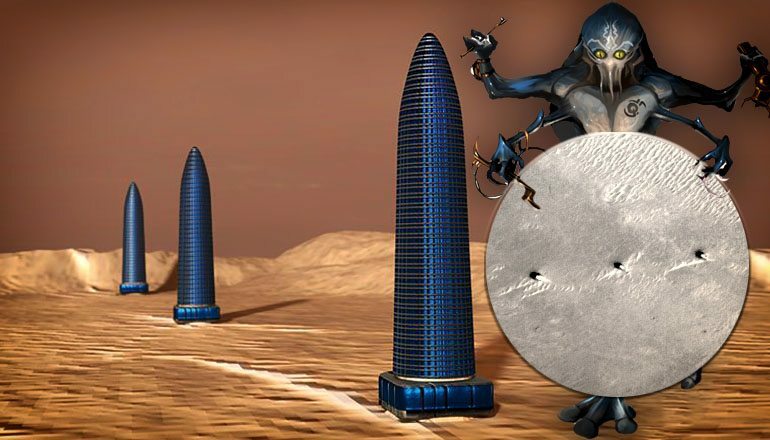 The martian towers are located in a region known as Terra Meridiani. Coincidentally or not, that exact region was chosen as a landing spot for NASA’s Curiosity Rover. But when the stakes are literally this high, there is no room for coincidence. Just imagine the rover leaving tracks at the base of these towers or the knowledge that could be gathered if a manned mission ever got the chance to explore whatever these so-called towers are. The location of the towers seems to have been specifically chosen for its equatorial position. It stands to reason that the ancient martians might have also relied on solar power even if they were farther away from the sun. And what better place to get sunlight than the equator? Standing apart from the surrounding plains like three sore thumbs, the towers seem to have withstood the test of time. This could be considered a testament to the proficiency of their builders or it might also mean the towers are still in use. No use in erecting something as majestic as these martian skyscrapers and then abandoning them. If there is still someone left on Mars, that is.